South Korea’s solar powerhouse OCI Co. has invested 5 billion won ($4.4 million) in SN BioScience, its first investment in a biotech startup since it last year vowed to enter the biotech business in partnership with Korea’s major drug company Bukwang Pharm. OCI said Monday that it has acquired a 29.3 percent stake in local bio tech startup SN BioScience at 5 billion won, becoming the largest stakeholder of the startup. 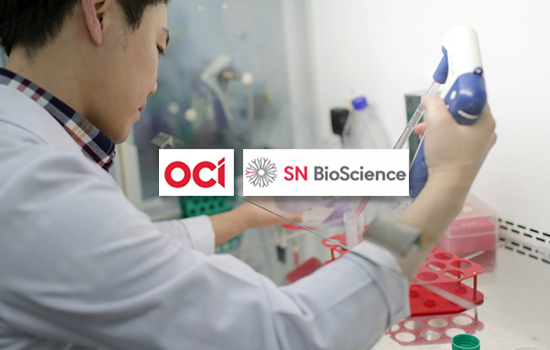 With the stake acquisition, OCI has obtained the rights to co-develop SN BioScience’s pancreatic cancer treatment candidate’s pipeline and the priority rights for reviewing new pipelines. Shares of OCI closed Tuesday 0.4 percent higher at 99,200 won. The deal is OCI’s first investment in a biotech company since it set up a 50-50 joint venture with Bukwang Pharm in July to unearth promising bio tech startups and make a strategic investment in projects ranging from developing drugs to technology transfer. OCI said it would inject more than 10 billion won into the JV called B&O Bio every year. SN BioScience is a nano-medicine research and development company based in Seoul. It is best known for “SNB-101,” drug candidate for treating pancreatic cancer, and “double core-shell micelle” technology, which enables producing stable nano-sized micelle for poorly soluble drugs, according to the company. SNB-101 has passed the scale-up stage or the approval for mass production and succeeded test production at a plant certified by the European Union’s drug authority on good manufacturing practices (GMP) standards. Currently, the company is readying to file an application for phase 1 clinical trial with Korea’s Ministry of Food and Drug Safety and U.S. Food and Drug Administration.